Marriage*: He married Sara Jane Wilson. [S79] Mrs. Dillard Ellington, "Joe Edmundson Family," in Navarro County History, vol. 2 (Corsicana, Tex. : The Navarro County Hist. Soc'y, 1978), p. 206. [S79] Mrs. Dillard Ellington, "Joe Edmundson Family," above (naming Ira Pickering as her father). Marriage*: She married Ira Pickering. [S79] Mrs. Dillard Ellington, "Joe Edmundson Family," above (giving only the year and not naming the place). [S11] Index to Texas Death Records (Austin, Tex. : Tex. Dept. of Health, Bur. of Vital Statistics), typescript, 1941-45, vol. 9, p. 4178, file 48520 (giving her name as Josephine E. Pickering). [S79] Mrs. Dillard Ellington, "Joe Edmundson Family," above (giving only the year). [S312] Social Security Death Index, online at http://tinyurl.com/AncestrySSDI, viewed on 23 Feb 1998. [S312] Social Security Death Index, online at http://tinyurl.com/AncestrySSDI, viewed on 23 Feb 1998 (stating that he died in Oct 1986; not naming the place of death but stating that he lived in Anthony, New Mexico when he died). Other Names*: Maude Edmundson, Maud Burdine. Note*: She was known as Maud. They lived in Tupelo, Navarro County, Texas. [S312] Social Security Death Index, online at http://tinyurl.com/AncestrySSDI, viewed on 6 Mar 1998 (giving her name as Maud Burdine). [S961] Find A Grave, online at http://www.findagrave.com, memorial for Maud Edmundson Burdine, memorial no. 81111548. [S90] Mrs. Dillard Ellington, "Cal Burdine Family," in Navarro County History, vol. 2 (Corsicana, Tex. : The Navarro County Hist. Soc'y, 1978), pp. 205-06 (giving the year but no other details). [S79] Mrs. Dillard Ellington, "Joe Edmundson Family," above (giving the year but no other details). [S961] Find A Grave, online, above, memorial for Richard Baxter Burdine, memorial no. 81111644. [S312] Social Security Death Index, online at http://tinyurl.com/AncestrySSDI, viewed on 6 Mar 1998 (not naming the place of death but stating that she lived in Corsicana, Texas when she died). [S79] Mrs. Dillard Ellington, "Joe Edmundson Family," above (naming Annie Maud Edmundson as his mother). [S312] Social Security Death Index, online at http://tinyurl.com/AncestrySSDI, viewed on 6 Mar 1998 (not naming the place of death but stating that she lived in Plano, Texas when she died). Other Names*: Richard Burdine, Baxter Burdine. Note*: He was known as Baxter. [S90] Mrs. Dillard Ellington, "Cal Burdine Family," above (stating that he was born in Mississippi in 1892). [S961] Find A Grave, online at http://www.findagrave.com, memorial for Richard Baxter Burdine, memorial no. 81111644 (giving the date but not the place). [S90] Mrs. Dillard Ellington, "Cal Burdine Family," above (giving the year but no other details). [S79] Mrs. Dillard Ellington, "Joe Edmundson Family," in Navarro County History, vol. 2 (Corsicana, Tex. : The Navarro County Hist. Soc'y, 1978), p. 206 (giving the year but no other details). [S961] Find A Grave, online, above, memorial for Maud Edmundson Burdine, memorial no. 81111548. [S783] Ron Whitehead, electronic mail to Roger Bartlett, 25 Oct 2002, (stating that he was born in 1856, attributing information to grave marker, without naming the place). [S80] Elizabeth Phillips, Elizabeth Kelt, and "Bud" Kelt, "Kelt Family," in Navarro County History, vol. 2 (Corsicana, Tex. : The Navarro County Hist. Soc'y, 1978), pp. 208-09, (stating that he was born in 1853 in English Churn, Lousiana). [S7] Navarro County, Texas Marriages, vol. 1, 1846-1888 (Corsicana, Tex. : The Navarro County Gen. Soc'y, 1987), p. 86 (stating that they married on 24 Dec 1885 in Navarro Co., Tex. but not naming the town) (citing Navarro Co., Tex. Marriage Records, vol. V, p. 69). [S80] Elizabeth Phillips, et al., "Kelt Family," above, (stating that she was from Chatfield and that they married in 1885 without giving the complete date or place). [S80] Elizabeth Phillips, et al., "Kelt Family," above, (attributing information to grave marker). [S80] Elizabeth Phillips, et al., "Kelt Family," above. [S80] Elizabeth Phillips, et al., "Kelt Family," above, (naming Jules J. Kelt as his father). [S783] Ron Whitehead, electronic mail to Roger Bartlett, 25 Oct 2002, (naming Jules Julian Kelt as his father). [S80] Elizabeth Phillips, et al., "Kelt Family," above, (giving his name as Will and naming Jules J. Kelt as his father). [S80] Elizabeth Phillips, et al., "Kelt Family," above, (giving her name as Genie and naming Jules J. Kelt as her father). [S783] Ron Whitehead, electronic mail to Roger Bartlett, 25 Oct 2002, (naming Jules Julian Kelt as her father). [S961] Find A Grave, online at http://www.findagrave.com, memorial for Meade Eugenia "Genie" Kelt Cole, memorial no. 44345357, viewed on 7 Feb 2011 (naming Jules Jeane Kelt, Sr. as her father). [S80] Elizabeth Phillips, et al., "Kelt Family," above, (naming Jules J. Kelt as her father). [S80] Elizabeth Phillips, et al., "Kelt Family," above, (giving her name as Gussie and naming Jules J. Kelt as her father). [S80] Elizabeth Phillips, et al., "Kelt Family," above, (giving her name as Rita and naming Jules J. Kelt as her father). [S80] Elizabeth Phillips, Elizabeth Kelt, and "Bud" Kelt, "Kelt Family," in Navarro County History, vol. 2 (Corsicana, Tex. : The Navarro County Hist. Soc'y, 1978), pp. 208-09, (stating that she was from Chatfield and that they married in 1885 without giving the complete date or place). [S80] Elizabeth Phillips, et al., "Kelt Family," above, (naming Willie Edwards as his mother). [S783] Ron Whitehead, electronic mail to Roger Bartlett, 25 Oct 2002, (naming Willie Posey Edwards as his mother). [S80] Elizabeth Phillips, et al., "Kelt Family," above, (giving his name as Will and naming Willie Edwards as his mother). [S80] Elizabeth Phillips, et al., "Kelt Family," above, (giving her name as Genie and naming Willie Edwards as her mother). [S783] Ron Whitehead, electronic mail to Roger Bartlett, 25 Oct 2002, (naming Willie Posey Edwards as her mother). [S961] Find A Grave, online at http://www.findagrave.com, memorial for Meade Eugenia "Genie" Kelt Cole, memorial no. 44345357, viewed on 7 Feb 2011 (naming Willie Posey Edwards Kelt, Sr. as her mother). [S80] Elizabeth Phillips, et al., "Kelt Family," above, (naming Willie Edwards as her mother). [S80] Elizabeth Phillips, et al., "Kelt Family," above, (giving her name as Gussie and naming Willie Edwards as her mother). [S80] Elizabeth Phillips, et al., "Kelt Family," above, (giving her name as Rita and naming Willie Edwards as her mother). [S80] Elizabeth Phillips, Elizabeth Kelt, and "Bud" Kelt, "Kelt Family," in Navarro County History, vol. 2 (Corsicana, Tex. : The Navarro County Hist. Soc'y, 1978), pp. 208-09, (giving his name as Will and naming Jules J. Kelt as his father). [S80] Elizabeth Phillips, Elizabeth Kelt, and "Bud" Kelt, "Kelt Family," in Navarro County History, vol. 2 (Corsicana, Tex. : The Navarro County Hist. Soc'y, 1978), pp. 208-09, (naming Jules J. Kelt as his father). [S312] Social Security Death Index, online at http://tinyurl.com/AncestrySSDI, viewed on 26 Oct 2002 (stating that he was born on 24 Dec 1890 without naming the place). [S312] Social Security Death Index, online at http://tinyurl.com/AncestrySSDI, viewed on 26 Oct 2002 (stating that he died in Jan 1978; not naming the place of death but stating that he lived in Albuquerque, N.M. when he died and that last benefits were sent to an address in Farmington, N.M.). Other Names*: Eugenia Kelt, Genie Kelt, Meade Eugenia Cole, Meade Eugenia Kelt Cole, Eugenia Cole, Eugenia Kelt Cole, Genie Cole, Genie Kelt Cole. • Her Find A Grave memorial, including a picture of her grave marker, is here. [S80] Elizabeth Phillips, Elizabeth Kelt, and "Bud" Kelt, "Kelt Family," in Navarro County History, vol. 2 (Corsicana, Tex. : The Navarro County Hist. Soc'y, 1978), pp. 208-09, (giving her name as Genie and naming Jules J. Kelt as her father). [S961] Find A Grave, online, above, memorial for Meade Eugenia "Genie" Kelt Cole, memorial no. 44345357, viewed on 7 Feb 2011 (naming Willie Posey Edwards Kelt, Sr. as her mother). [S783] Ron Whitehead, electronic mail to Roger Bartlett, 25 Oct 2002, (giving the date and county but not the city). [S1207] Corsicana Daily Sun, Corsicana, Tex., online archive at http://corsicana.newspaperarchive.com, 29 Mar 1922, p. 7, col. 4 (obituary of Mrs. Louie Cole, reprinted here with consent of the Corsicana Daily Sun) (giving the city but no other information). [S1207] Corsicana Daily Sun, Corsicana, Tex., online archive, above, 29 Mar 1922, p. 7, col. 4 (obituary of Mrs. Louie Cole, reprinted here with consent of the Corsicana Daily Sun). [S961] Find A Grave, online, above, memorial for Meade Eugenia "Genie" Kelt Cole, memorial no. 44345357, viewed on 7 Feb 2011 (not giving the date). [S1207] Corsicana Daily Sun, Corsicana, Tex., online archive, above, 29 Mar 1922, p. 7, col. 4 (reprinted here with consent of the Corsicana Daily Sun). Other Names*: Clara Louise Kelt Bell, Clara Kelt Bell, Clara Louise Bell, Clara Bell. [S80] Elizabeth Phillips, Elizabeth Kelt, and "Bud" Kelt, "Kelt Family," in Navarro County History, vol. 2 (Corsicana, Tex. : The Navarro County Hist. Soc'y, 1978), pp. 208-09, (naming Jules J. Kelt as her father). [S312] Social Security Death Index, online at http://tinyurl.com/AncestrySSDI, viewed on 26 Oct 2002 (stating that she was born on 15 Apr 1895 without naming the place). [S31] Navarro Leaves and Branches, vol. 42, no. 1 (Mar 2019), p. 39. [S312] Social Security Death Index, online at http://tinyurl.com/AncestrySSDI, viewed on 26 Oct 2002 (stating that she died in Sep 1989; not naming the place of death but stating that she lived in Wortham, Tex. when she died). [S80] Elizabeth Phillips, Elizabeth Kelt, and "Bud" Kelt, "Kelt Family," in Navarro County History, vol. 2 (Corsicana, Tex. : The Navarro County Hist. Soc'y, 1978), pp. 208-09, (giving her name as Gussie and naming Jules J. Kelt as her father). [S153] Navarro County Cemetery Records, vol. 3, above, p. 26 (identifying Mary Frances as wife of P. T. Montfort). [S81] Mrs. J. H. Montfort, "Peter T. Montfort," above, (naming Peter Terrell Montfort as his father). [S961] Find A Grave, online at http://www.findagrave.com, memorial for J. T. Montfort, memorial no. 50757593, viewed on 24 Jul 2011 (naming Peter Terrell Montfort as his father). [S81] Mrs. J. H. Montfort, "Peter T. Montfort," above, (naming Peter Terrell Montfort as her father). [S153] Navarro County Cemetery Records, vol. 3, above, p. 26 (identifying her as daughter of P. T. Montfort). [S153] Navarro County Cemetery Records, vol. 3, above, p. 26 (identifying him as son of P. T. Montfort). [S204] Records of Bank Sutherland Funeral Home (later McCammon Funeral Home), Corsicana, Texas, in Navarro Leaves and Branches, vol. IV, no. 4 (Nov 1981), p. 18 (spelling his last name as Monfort and naming "P. T. Monfort" as his father). [S81] Mrs. J. H. Montfort, "Peter T. Montfort," above, (naming Mary Frances Edwards as his mother). [S961] Find A Grave, online at http://www.findagrave.com, memorial for J. T. Montfort, memorial no. 50757593, viewed on 24 Jul 2011 (naming Mary Frances Montfort as his mother). [S81] Mrs. J. H. Montfort, "Peter T. Montfort," above, (naming Mary Frances Edwards as her mother). [S153] Navarro County Cemetery Records, vol. 3, above, p. 26 (identifying her as daughter of Fannie Montfort). [S153] Navarro County Cemetery Records, vol. 3, above, p. 26 (identifying him as son of M. F. Montfort). James T. Montfort's tombstone, Old Cemetery, Chatfield, Tex. A copy of his death certificate is here. [S81] Mrs. J. H. Montfort, "Peter T. Montfort," in Navarro County History, vol. 2 (Corsicana, Tex. : The Navarro County Hist. Soc'y, 1978), p. 211, (naming Peter Terrell Montfort as his father). [S961] Find A Grave, online, above, memorial for J. T. Montfort, memorial no. 50757593, viewed on 24 Jul 2011 (naming Mary Frances Montfort as his mother). [S961] Find A Grave, online, above, memorial for Mollie Moore Montfort, memorial no. 50757544, viewed on 24 Jul 2011. [S153] Navarro County Cemetery Records, vol. 3, above, p. 26 (giving the date but not the place). [S81] Mrs. J. H. Montfort, "Peter T. Montfort," in Navarro County History, vol. 2 (Corsicana, Tex. : The Navarro County Hist. Soc'y, 1978), p. 211, (naming Peter Terrell Montfort as her father). [S153] Navarro County Cemetery Records, vol. 3 (Corsicana, Tex. : The Navarro County Gen. Soc'y, 1984), p. 26 (identifying her as daughter of P. T. Montfort). [S153] Navarro County Cemetery Records, vol. 3 (Corsicana, Tex. : The Navarro County Gen. Soc'y, 1984), p. 26 (identifying him as son of P. T. Montfort). [S153] Navarro County Cemetery Records, vol. 3, above, p. 26 (giving the date as 9 Aug 1880, which probably should be 1870 based on believed birth order of him and his siblings). 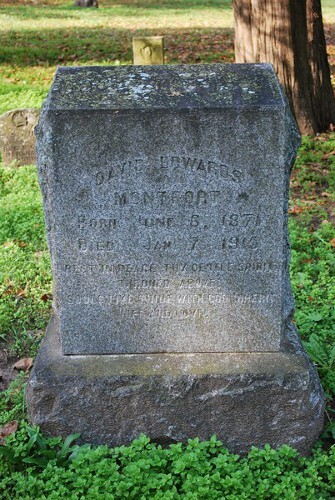 David Edwards Montfort's tombstone, Old Cemetery, Chatfield, Tex. Obituary*: Farmer Accidentally Killed Near Rice. [S121] Grave marker, Old Cemetery, Chatfield, Tex. [S204] Records of Bank Sutherland Funeral Home, above, in Navarro Leaves and Branches, vol. IV, no. 4 (Nov 1981), p. 18. [S31] Navarro Leaves and Branches, vol. 30, no. 4 (Nov 2007), p. 25 (spelling his name as Montford). [S67] The Dallas Morning News, Dallas, Tex., 9 Jan 1915, p. 5 (stating that he was killed near Rice). [S961] Find A Grave, online at http://www.findagrave.com, memorial for David Edwards Montfort, memorial no. 44431249, viewed on 24 Jul 2011 (giving the date but not the place). [S961] Find A Grave, online, above, memorial for David Edwards Montfort, memorial no. 44431249, viewed on 24 Jul 2011. [S31] Navarro Leaves and Branches, above, vol. 30, no. 4 (Nov 2007), p. 25. [S67] The Dallas Morning News, Dallas, Tex., 9 Jan 1915, p. 5. [S67] The Dallas Morning News, Dallas, Tex., 9 Jan 1915, p. 5 ("Farmer Accidentally Killed Near Rice"). Marriage*: He married Elizabeth Lindsey. [S153] Navarro County Cemetery Records, vol. 3, above, p. 26 (bearing a Woodmen of the World insignia). [S879] Constance Montfort, electronic mail to Roger Bartlett, 7 Sep 2003, (naming Matthew Harris Montfort as his father). 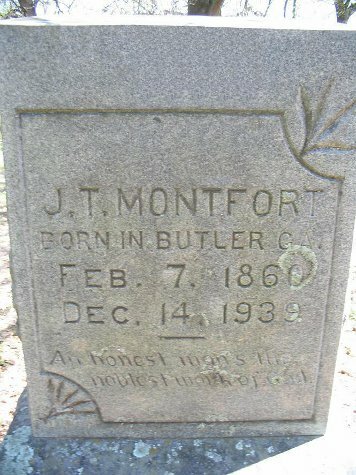 [S81] Mrs. J. H. Montfort, "Peter T. Montfort," above, (stating that he was born in Texas but not giving the date). [S81] Mrs. J. H. Montfort, "Peter T. Montfort," above, (giving the date and city). [S31] Navarro Leaves and Branches, vol. 29, no. 3 (Aug 2006), p. 15 (citing Navarro County, Tex. Marriage Records, bk. XVI, p. 284) (giving the date and county). [S67] The Dallas Morning News, Dallas, Tex., 28 Oct 1933, sec. II, p. 7 (obituary of R. E. Montfort). [S796] Navarro County Cemetery Records, vol. 7, above, New Chatfield Cemetery survey, p. 5 (naming the place but not giving the date). [S67] The Dallas Morning News, Dallas, Tex., 28 Oct 1933, sec. II, p. 7 (obituary of R. E. Montfort) (stating that he would be buried in the Chatfield cemetery on 28 Oct 1933 without identifying which cemetery). [S67] The Dallas Morning News, Dallas, Tex., 28 Oct 1933, sec. II, p. 7. [S81] Mrs. J. H. Montfort, "Peter T. Montfort," above, (naming Robert Early Montfort as his father). [S81] Mrs. J. H. Montfort, "Peter T. Montfort," above, (gving only the place). [S190] Navarro County Cemetery Records, vol. 10 (Corsicana, Tex. : The Navarro County Gen. Soc'y, 1990), p. 58 (giving only the date). [S190] Navarro County Cemetery Records, vol. 10, above, p. 58. [S190] Navarro County Cemetery Records, vol. 10, above, p. 58 (spelling surname as Monfort) (common stone with Emma L. Montfort). [S67] The Dallas Morning News, Dallas, Tex., 6 Apr 1955, sec. 1, p. 16 (obituary of W. F. Montfort). [S67] The Dallas Morning News, Dallas, Tex., 28 Oct 1933, sec. II, p. 7 (obituary of R. E. Montfort) (giving his name as Frank Montfort). [S67] The Dallas Morning News, Dallas, Tex., 6 Apr 1955, sec. 1, p. 16. [S81] Mrs. J. H. Montfort, "Peter T. Montfort," above, (naming Elizabeth Frances Burleson as her mother). [S312] Social Security Death Index, online at http://tinyurl.com/AncestrySSDI, viewed on 26 Dec 2003 (stating that she died in May 1970; not naming the place of death but stating that she lived in Corsicana, Tex. when she died). [S11] Index to Texas Death Records (Austin, Tex. : Tex. Dept. of Health, Bur. of Vital Statistics), typescript, 1970, vol. 3, p. 1046, file 36819. [S585] Corsicana Daily Sun, Corsicana, Tex., online at http://www.corsicanadailysun.com viewed on 3 Nov 2011 (obituary of Theo Thorp Montfort) (Bertha Easterling Montfort). [S796] Navarro County Cemetery Records, vol. 7, above, New Chatfield Cemetery survey, p. 5 (Bertha Montfort).